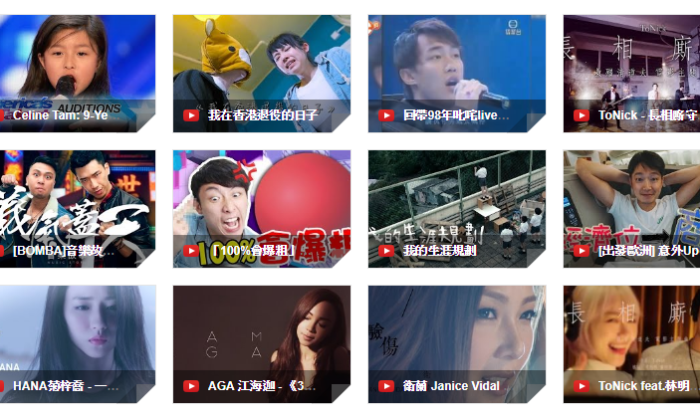 YouTube Hong Kong Rewind 2017 revealed Hongkongers’ trending video content on the platform. Among the top 10 trending videos on YouTube Hong Kong in 2017, 10-year-old Celine Tam’s singing performance on US talent show America’s Got Talent ranked first place as the most viewed video. Local YouTube creator FHProductionHK hit second place with “我在香港退役的日子”, which talks about the things that men can do for the women they have a crush on. The brainchild behind the channel, nicknamed “Teddy Head”, was a typical university student four years ago; with creativity and hard work, he paved the way to becoming one of the most popular creators in Hong Kong, now working full-time as a YouTube creator. Traditional media also engage with netizens via YouTube. E Media Plus, the publisher of one of Hong Kong’s Chinese weekly magazines, E-Weekly, delivers entertainment news in video format. The priIts video content “回帶98年叱咤live 網民極讚陳奕迅：以前佢把聲真係神級”, which replayed Cantopop legend Eason Chan’s performance in 1998, has attracted over one million views on YouTube. Hong Kongers love Cantopop, and local band ToNick’s love song “長相廝守” secures a spot on the YouTube Hong Kong top 10 trending local music videos in 2017. ToNick began their career as a local indie music band and uploaded their music videos on YouTube. Following a tremendous number of views they have since secured a contract with a music labels to further promote their music. According to Google’s consumer barometer, Hong Kongers look for entertainment and inspiration (42%), new hobbies (38%) and relaxation (33%) when watching videos online. Despite the growing popularity of K-pop in Hong Kong, Cantopop is still the favorite for Hongkongers. It is interesting to note that half of the Cantopop music videos in the chart are theme songs of TV dramas and movies. “陪著你走” by Kayee Tam and “我不會撒嬌” by Stephanie Ho, for example, are the theme songs for TV drama “My Unfair Lady” (不懂撒嬌的女人) which was an instant hit when aired. This reflects that people search for more information about the dramas and movies, and rewind on YouTube. Creators’ dedication and commitment are crucial for running a successful channel, YouTube said. To recognise creators’ talent, hard work and success, YouTube presents silver, gold, and diamond creator awards to those with channels reaching 100,000, 1 million and 10 million subscriptions respectively. This year, 52 Hong Kong YouTube creators have hit the 100,000 subscription milestone. Among those, newcomer Emi Wong has the fastest-growing channel where she shares her workout tutorials and fitness tips. Her channel exceeded 100,000 subscriptions in the four months since April 2017, securing her the crown as the top rising YouTube Hong Kong creator in 2017. Agatha Yap, former marketing and development director at Watson's Personal Care Stores Singapore, has taken on the role of senior .. Though the overall consumer confidence remains strong, consumers are more willing to channel their spare cash into savings. .. The CASBAA Board of Directors announced that Jonathan Spink, CEO of HBO Asia, has been elected chairman of the board of directors ..
Had a wild weekend? This campaign will remind you to keep your drinking under control. ..